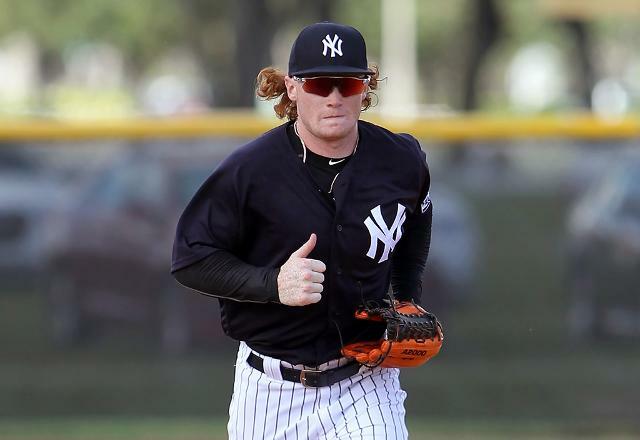 With recent New York Yankees call-up Dustin Fowler having suffered a beyond unfortunate and gruesome season-ending knee injury in his MLB debut, the team quickly made a move for his replacement on the roster by promoting another top minor league hitter in the form of the flamboyant and powerful Clint Frazier. Playing with a flair for the dramatic, Frazier will debut with the Yankees on Saturday and bring his thunderous bat to the majors where he is capable of doing immediate damage. Considered one of the top outfield prospects in baseball, Frazier came to the Yankees last summer in the Andrew Miller deal and he was the fifth overall pick in the 2013 draft to drive home his pedigree status. Just 22-years-old, Frazier comes off a 2017 stint at Triple-A where he hit .257 with 12 home runs and 9 stolen bases in 319 at-bats. The tools jump off the page here as Frazier has very good speed to pick up steals and as noted earlier, his power is immense and natural. Like most young sluggers, Frazier lacks a bit in the plate discipline department by striking out a lot but the does offset that by taking a ton of walks at every level he has performed at. There is no definitive word on how long Frazier could stick around but he should be picked up in all formats where available due to the power/speed game and significant upside.